When you start digging up a city as old as London you're bound to find a bit more of its history. Crossrail, a new major railway of 118km travelling east to west across London has involved excavations that have unearthed some interesting treasures. A piece of amber, very rare in London. Part of a manor house from the 15th century. 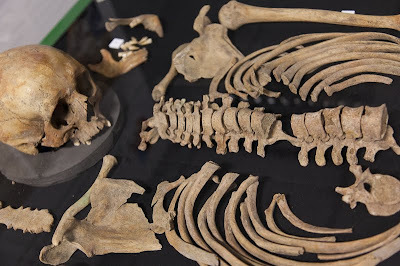 Glassware, Tudor shoes and this skeleton from the infamous Bedlam psychiatric hospital, are currently on display at the Crossrail Visitors information Centre near Tottenham Court Road station until 27 October. What a photo - I shudder to think of the story that skeleton would tell. I love that old artifacts are still discovered all the time, whenever new construction/digging happens. A skeleton? I don't think this is an exhibition for me . . .